The summers in Florida are too long to put off fixing a malfunctioning air conditioner, especially equipment that isn’t properly cooling the air that is being pushed through your home’s vents. That’s why at LIBERTYAIR, we offer timely emergency air conditioner repair and service. Let us help keep your home cool and comfortable with a quick diagnosis of the issue and professional level repairs. 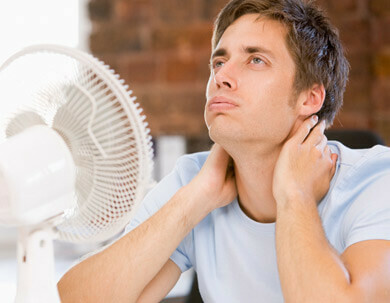 If your air conditioner isn’t cooling properly, contact LIBERTYAIR, day or night! When your air conditioner is on the fritz, it might be best to contact a professional service and repair company to safety diagnose the issue and quickly repair the unit. Common A/C problems that can result in warm airflow include faulty thermostats, condenser fans, condenser fan motors, obstructions in the equipment, tripped circuit breakers and blown fuses. My air conditioner isn’t cooling. What should I do? Many homeowners try to diagnose air conditioner problems before they call a professional. In some instances, this can help save time in evaluating the underlying causes to an air conditioner that isn’t working properly. However, if an air conditioner isn’t cooling the air, we encourage homeowners to call us for emergency service and repair. Changing the fuse or flipping circuit breakers to an outdoor air conditioning unit can be dangerous in inexperienced hands. Never plug the A/C unit into a different outlet without knowing the voltage of the unit and the outlet, and due to the high voltage of the fuses required, we recommend letting our professional technicians handle the task. There are a few simple things you can check at home to report to our technicians that can promote a speedy diagnosis. Check that the condenser fan is running. If the fan is not spinning, there could be an obstruction in the equipment or the condenser fan motor could be burned out. Listen for the sound of the compressor. If you can’t hear the compressor, then a technician will need to replace motor. However, we don’t expect you to do our hard work. Our air conditioning emergency repair technicians are able to provide a quick diagnosis of any issue and address the problem as quickly as possible. We have years of experience repairing Florida air conditioning systems, making a major problem for others just a minor inconvenience for your family. LIBERTYAIR is quickly becoming Gainesville’s No. 1 company for air conditioning and heating installation, maintenance and repair because we provide the highest quality of service in North Central Florida. We strive to be quick, efficient and affordable in all of our services, and the extensive knowledge of our technicians puts us far above the competition. When your air conditioner isn’t cooling properly, call LIBERTYAIR. We can quickly diagnose the underlying issue and provide the necessary maintenance or repairs to get your equipment running and back to cooling your home. We’ll check your condenser fan, condenser fan motor, refrigerant levels, compressor and coils, as well as investigate any vent blockages or other concerns that can lead to a hot and uncomfortable home.